Medium to swimmer build. Takes pride in being in good shape. Tight buzz cut at all times. Moves slowly and with purpose rarely turning his head to look at people. If he does look around it is with his eyes only. Always wears his Bajoran D’jarra earring. Torrik Nils was born on Bajor towards the end of the Cardassian occupation. The exact date of his birth is unknown, although it occurred in the winter of 2356. His early life was marked by struggle in a Cardassian Labor camp with his family. During a failed attempt from Keldek Labor camp, Cardassian oppressors killed his younger brother along with all of the other children. The event marred Nils’ spirituality and he lost faith in the Bajoran prophets. Prior to the liberation of Bajor the Torrik family was relocated to Hutet Labor camp on Cardassia IV. They remained at Hutet until they, and the other Bajorans being held there, were rescued by the crew of the USS Ares in 2373. Nils had devised a way to send a message for help, which was received by the Ares and a Maquis vessel. Initially, Nils had been intrigued with the Maquis cause, but soon discovered the darker side of the movement. After this encounter with Starfleet, Nils was committed to enrolling himself. To the dismay of his family, Nils studied at the Bajoran Institute of Science with a specialization in Quantum Mechanics and Particle Physics. After graduating, he applied and was accepted to Starfleet Academy. He graduated top of his class with further Science specialization in the officer preparation program. Nils’ first assignment was to the Beta Quadrant and Megiddo Station. Prior to his first posting his assignment was stalled out as Starfleet Medical insisted on counseling to resolve some of his childhood issues. During this time he met Jillian Munro, and fell in love. Their tumultuous relationship was on again/off again (even to this day), but worked to draw him from his shell. Following his training cruise, he served aboard the USS Sentinel in a few capacities, but landed finally as the Chief of Science. This posting had the miraculous effect of ultimately rebirthing an interest in his forgotten faith in the Prophets. The struggle for spiritual understanding began anew. During a mission to scan a spatial anomaly, Nils and other crewmembers of the Sentinel were lost in a rift and deposited many light years away, where they were picked up by the USS Hawking. 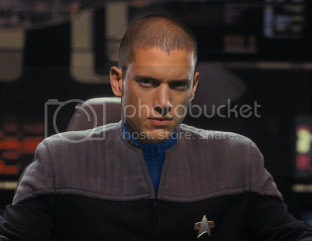 Due to the nature of both ship’s respective missions, Nils remained on board Hawking and took up his beloved role of Chief of Science. After a few months of service, he was granted a promotion to Executive Officer and retains that position presently.